Half-length portrait of Edward Sabine looking to the viewer’s right. Dressed in a dark single-breasted frock coat, black tie and high collared shirt. Sabine holds in both hands a paper document with a round brass tie, the paper headed: “Terrestrial Magnetism 11”18”. Sabine is posed with regalia to signify his office as President of the Royal Society. To the left of the painting and slightly behind Sabine is the Society’s sculpture bust of Sir Joseph Banks by Sir Francis Chantrey. To the right and in front of Sabine is the head of the Society’s silver mace lying on its red velvet and tasselled cushion. 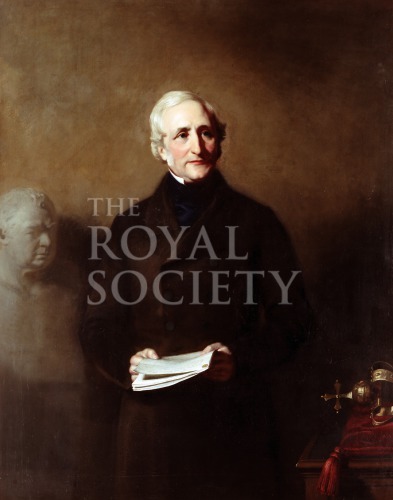 Sabine was elected a Fellow of the Royal Society in 1818, he served as its President from 1861-1871. Presented by Lady Elizabeth Juliana Sabine (1807-1879), 1866. The donation is recorded in Council Minutes: “Dr Sharpey stated that he had been requested by Mrs Sabine to communicate to the Council her desire to present to the Royal Society a Portrait of the President, painted by Mr.Pearce. Resolved That the Council have great pleasure in accepting, on behalf of the Society, the Portrait of their esteemed President, and desire the Secretary to convey to Mrs Sabine the expression of their sincere gratification, and their most cordial thanks for her highly valued present.“ [Royal Society Council Minutes, Original, CMO/14, meeting of 11 October 1866].